Designed to meet USDA (United States Department of Agriculture – Dairy Division) standards, these pumps are the ultimate in leak protection and clean pumping with the paired performance of AODD technology. Whether in a clean-in-place or clean-out-of-place application, these pumps will exceed the need for reliability and cleanability. Some of their most exceptional features include. Pair with Electronic Leak Detection for full USDA compliance. Electropolished 316 and 302/304 Stainless Steel components. 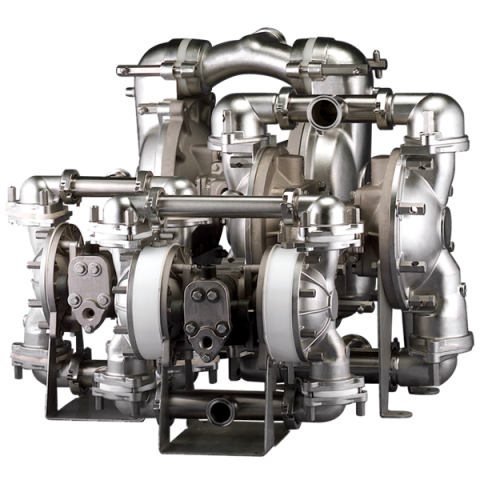 Rotatable manifolds, and top or bottom discharge available. Click here for SSB1 Metallic Pump Data Sheet.